Yogyakarta – Wednesday, February 6, 2019, Master of Science and Doctorate Program (MD) FEB UGM held an open defense for students on behalf of Supia Yuliana, M.M. who works as a lecturer in the Department of Business Administration at Sendawar Polytechnic, West Kutai and a senior researcher at the Institute of Resource Governance and Social Change (IRGSC). Dr. Supia Yuliana M.M. 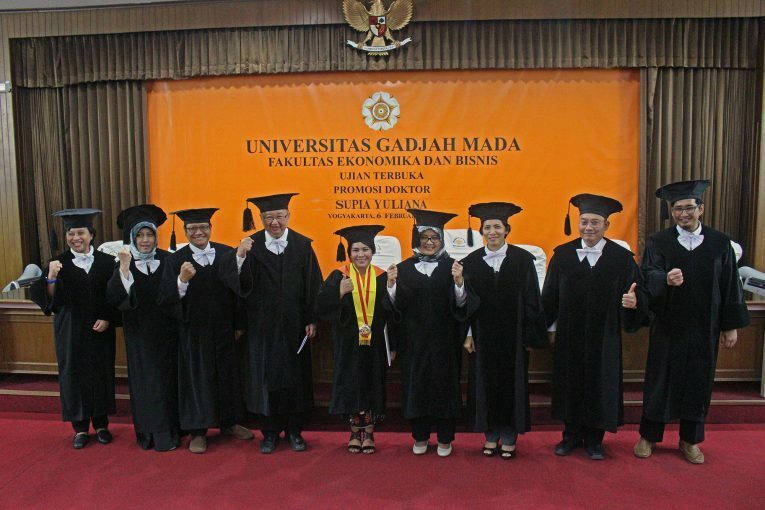 is a student of Management Doctoral Program student who succeeded as the 264th doctorate who graduated from the FEB UGM Doctoral Program and the 4339th doctorate who graduated from Gadjah Mada University with a very satisfying predicate. Dr. Supia Yuliana, M.M. succeeded in completing his dissertation with the title “The Effect of Asymmetry Intragroup Conflict Perception on Team Dysfunctional Behavior Moderated by Team Structure: Team Profile as Structure and Function of Intragroup Conflict Situation.” by looking at the positive impact of research that has been testing more negative impacts so far. Furthermore, the contribution of the dissertation to practitioners is that this study provides input to managers not to worry about conflict asymmetry in conditions of high horizontal groups – groups that have special skills that other groups do not have. The open defense was attended by a team of promoters namely T. Hani Handoko, M.B.A., Ph.D as the promoter, and Ely Susanto, M.B.A., Ph.D. and Dr. Reni Rosari, M.B.A. as co-promoter. In addition, there was also a testing team and assessment team, namely B.M. Purwanto, M.B.A., Ph.D., Sari Sitalaksmi, M.Mgt., Ph.D., Dr. Ratno Purnomo, M.Sc., Nurul Indarti, Sivilekonom, Cand. Merc., Ph.D., Rr. Tur Nastiti, M.Sc., Ph.D. On this occasion, both the promoter team, the testing team, and the assessment team asked Dr. Supia Yuliana.